My friend Kathy at tPF shared this on the wonderful polish thread and I nearly jumped for joy. I ADORE vintage everything (most likely because half of my childhood was spent in antique and thrift stores with my mother), so the adorable ad and fabulous polish names really appeal to me. 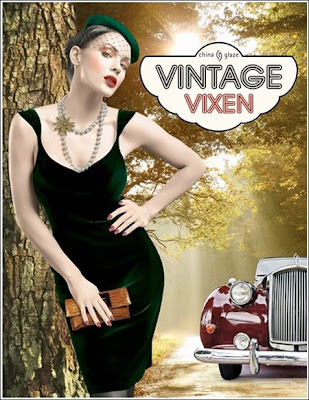 Vintage Vixen is China Glaze's Fall 2010 polish collection. Polishes will be available in July. Hey Doll, First Class Ticket, and Midnight Mission look amazing. Jitterbug and Emerald Fitzgerald = fabulous names! Thanks for sharing this Kathy!! Those are some pretty looking colours! tPF? As in The Purse Forums? I love them, don't care for the names, just want the GLITTTTERRR! So very fabulous - I agree!! Lissi - yup, the Purse Forum :) I love it there. are you a tPF member? Sorry for the delayed response. I am a member of tPF (LissiSays) but can't remember the last time I posted. LOL!